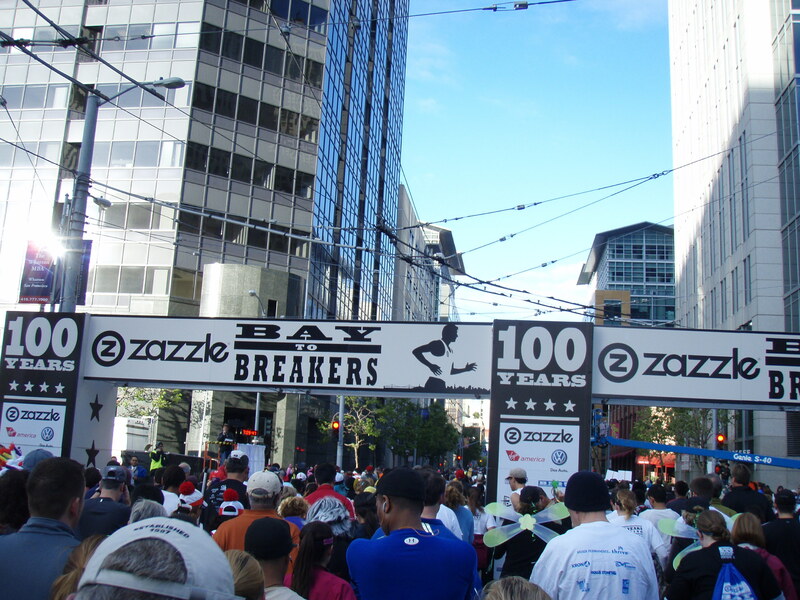 After I started running in a few races, I knew that one run on my bucket list was the infamous San Francisco Bay to Breakers. I had heard numerous stories about the costumes, the music, the party-atmosphere, and the naked people(!!!) and I just HAD to see this for myself. This girl came to the right race to see naked people. It’s clearly not a sexual thing though. The naked runners are all pretty old and have very “average” bodies, if you know what I mean. Our first B2B was on the 100th anniversary of the run. We dressed up as Team Coco… we procrastinated on getting costumes and defaulted to what we all had in our closets. It was cool, but I definitely felt like I wanted better costumes in the future. It was so cool to be a part of 100 years of history! The year after, my sister in-law Clara signed us up with the Girl Scouts to run as cookies. People loved them! There were a bunch of Girl Scout employees and supporters that had the cookie costumes, and a lot of people came up and took pictures of us! We even made it to their official promo video! Clara shared this video with us… The Samoa at 0:20 is me! I love Bay to Breakers! I’m so excited to be going back to SF to race it again this year. Best race IMO. Most definitely, afastpacedlife! I won’t be at B2B this year, but I’ll definitely miss it! Happy running! Hi there, I found your website via Google even as looking for a comparable subject, your web site came up, it appears good. I have bookmarked to favourites|added to my bookmarks.